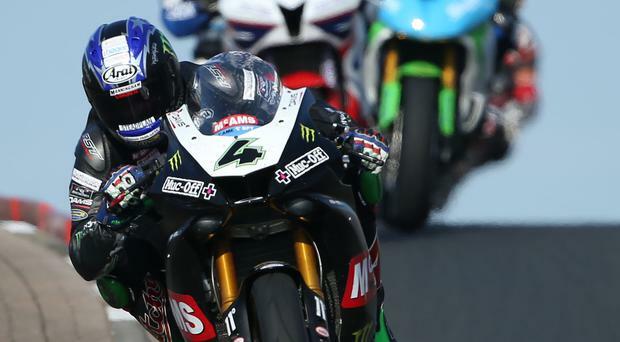 Ian Hutchinson will make his road racing return at next week's Vauxhall International North West 200 after Honda Racing boss Neil Tuxworth confirmed the 38-year-old will ride at the Triangle following a week of testing and racing. Three-time NW200 winner Hutchinson broke his left leg in a Senior TT crash last June and had the stabilising cage he had worn for the last 10 months removed last week. He rode a Honda race bike for the first time at Mallory Park last Friday and went on to compete in East Midland Racing Association Club races on Sunday and Monday at the same venue, winning two races and finishing second in another. NW200 Event Director Mervyn Whyte said: "Neil has kept me informed over the past week and the team are satisfied Ian is fit and able to make his Honda Racing debut alongside his team-mate Lee Johnston. "Ian is an experienced campaigner on the North Coast circuit and we are delighted he is making his return." As soon as the cage was removed last week, the Bingley Bullet was out on track clocking up the miles and getting all-important signatures on his TT race licence. He is to have another test at Cadwell Park before heading to the North West, with the Coleraine Club-promoted meeting also counting towards signatures. Hutchy, who won a record-breaking five solo TT races in a week in 2010, has been here before when he first broke the same leg in a Silverstone accident in that same year. His recovery was nothing short of miraculous, from fighting to save his leg from amputation, overcoming complications, coming through some 30 operations to finishing last year's NW200 with three podiums, a fourth and a fifth before winning two TT races, taking his total to 16. You can never rule out Hutchy, who has that single mindedness and will to succeed again despite the horrendous time he has had. In a separate development, Horst Saiger, who made his North West debut in 2012, will miss this year's event after breaking a wrist last weekend. Unable to compete, the Yamaha rider will still travel to the event to take in the action and meet up with fans.